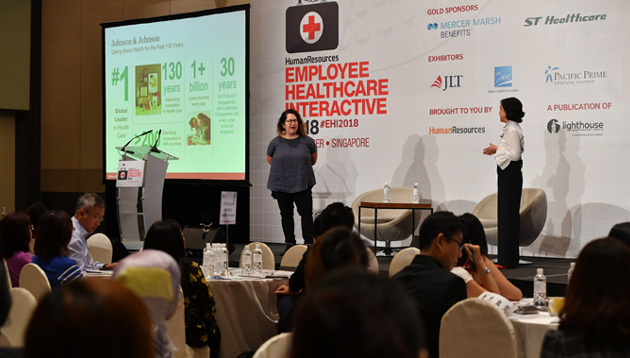 Speaking at the fourth edition of Employee Healthcare Interactive 2018, Singapore, Sarah McKensey and Daisylyn Edades gave a combined perspective of how the firm ensures a holistic approach to wellness. Back in 2015, Johnson & Johnson (J&J) defined a five-year plan to address its top three workforce health risks, i.e. unhealthy eating, physical inactivity, and stress. At the fourth edition of Employee Healthcare Interactive 2018, Singapore held at Novotel Clarke Quay on 12 October 2018, Sarah McKensey, APAC diversity and inclusion leader, and Daisylyn Edades, head of global health services APAC, Johnson & Johnson, gave a unique combined perspective of the company’s progress towards its 2020 vision of having the healthiest workforce in the world. In the keynote, Edades noted that with the complexity of the world of work, today and moving forward, comes the responsibility to help employees cope with it. The first step was to train employees in the principles of Energy for Performance®, a training program developed by the Johnson & Johnson Human Performance Institute. The program teaches people to be more spiritually nourished, physically focused and direct their energy towards what is purposeful in life. Adding to that, McKensey noted that during the programme, a lot of time was spent focusing on purpose. She said: “It is quite an amazing concept for an organisation to go out and invest in helping employees identify their unique purpose – even if this means their purpose is not aligned to working with our company- because fundamentally we know when our purpose is aligned to what we do, from the intentional, emotional, mental, and physical point of view, then we can really bring our best self. J&J continues to look at health holistically, where the three pillars of its five-year plan – healthy eating, healthy movement, and healthy mind – come together with driving different conversations around the aspect of mental health. With that thought, in conjunction with World Mental Health Day on 10 October, leaders from various functions at J&J came together to launch Mental Health Diplomats in Asia Pacific – part of an employee resource group (ERG) which is focused on breaking down stigma associated with mental illness. “What was wonderful was that we were able to align the global and local messaging,” McKensey said, explaining that the messages were coordinated in terms of the tone from the top, starting with a video message from the global head of HR, Peter Fasolo. Sharing some results, McKensey said: “We saw over 2,300 employees help raise awareness around stigma associated with mental illness in China by breaking the Guinness World Book of Records by watching this video called ‘Schizophrenia and Me’ using virtual reality glasses. McKensey concluded the session by highlighting the importance of ERGs: “These are incredible resources for you to leverage, to hear the voice of your employees, to allow them to drive culture change, and the power of their collaboration with your D&I partners, or other functions can truly help you shift your organisations,” she said. This knowledge was shared at the Human Resources’ conference, Employee Healthcare Interactive 2018, Singapore. To know more and attend more such events, please visit: http://www.humanresourcesonline.net/events/. In Singapore, the top HR tech used by jobseekers are social media ads, smartphone apps, and texting with a company. ..
Do you really know what your employees want - and need - when it comes to learning opportunities?.. Bosses could improve on relationship-building skills, and their team leadership capabilities, say staff. .. Younger employees around the world say they want a buddy, not a boss. Is it time for you to temper down your top-down mentality?..